The University of Central Florida has detected what could be its first planet, only two-thirds the size of Earth and located right around the corner, cosmically speaking, at a mere 33 light- years away. The exoplanet candidate called UCF 1.01, is close to its star, orbiting the star in 1.4 days. 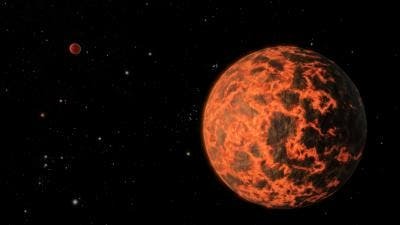 The planet's surface likely reaches temperatures of more than 1,000 degrees Fahrenheit. The discoverers believe that it has no atmosphere, is only two-thirds the gravity of Earth and that its surface may be volcanic or molten. The team noticed slight dips in the amount of infrared light streaming from the star. A review of Spitzer archival data showed that the dips were periodic, suggesting that a planet might be blocking out a small fraction of light as it passed in front of GJ 436, as seen from Earth. * "I could see these faint dips in the starlight and I wanted to determine their source. I knew that if these signals were periodic, they could be from an unknown planet," said Stevenson, who is now a postdoctoral scholar at the University of Chicago. This transit technique, used by a number of telescopes, including NASA's Kepler space telescope, relies on these tiny, partial eclipses to find exoplanet candidates. Spitzer has performed science work on known exoplanets before, but UCF-1.01 represents the first time Spitzer has made a transit discovery. With the finding of UCF-1.01, GJ 436 is likely now home to the first multi-transiting-planet system described by a mission other than Kepler. Of the 1,800 stars identified by Kepler as candidates for having planetary systems, only three are verified to contain sub-Earth size exoplanets. The depth and duration of a transit reveals basic properties of an exoplanet, such as its size and distance from a host star. In UCF-1.01's case, its diameter is estimated at 5,200 miles, or two-thirds that of Earth, placing the world among the smallest on record. The team also noticed hints of yet another potential planet dubbed UCF-1.02, but its period was impossible to estimate. So why aren't scientists calling UCF-1.01 a planet? A measured mass is needed to verify that these objects are planets, but even the most sensitive instruments currently available are unable to measure exoplanet masses this small. "Despite the lack of a confirmed mass, the team is confident future observations will verify our findings," Harrington said.